Forget the usual sticky floors, bad black lights, and pleather seating. Monarch’s three separate spaces are all thoughtfully designed—and surprisingly refined. The basement club, where the dancing goes down, features a concrete bar and DJ stand, two plush lounge areas, an elevated stage, and a Void Acoustics sound system. The upstairs lounge showcases a redwood bar, complementary photo booth, and aerial performers twirling overhead. And the adjacent drawing room offers a semi-private space for groups of up to 50, decked with black and white photos and an overhead wave of Edison bulb lighting. 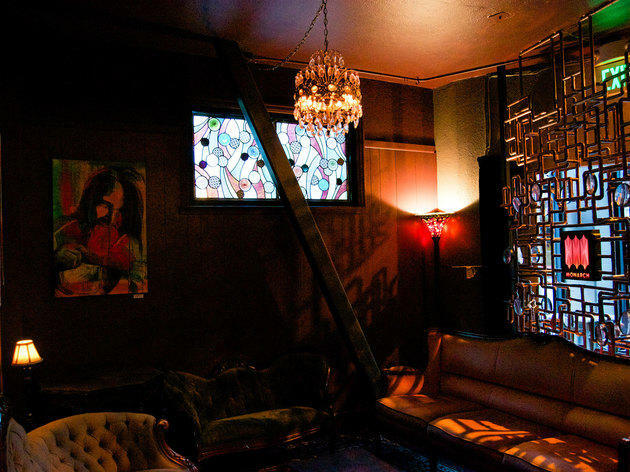 It’s an uncommonly upscale spot for rocking out to EDM and techno—then retiring upstairs for a cocktail.